I stopped in Burlington, VT last week for the night. I was on my way back after a long day on the road from Quebec. I stopped because I wanted to see again something very special. An unusual sculpture of an Indian. I remembered that it was located in Battery Bark. It’s a lovely park on a bluff with a spectacular view of magnificent Lake Champlain. It was dark out and drizzly. No moon. The lake was veiled in fog. I thought I remembered the exact spot. I walked yards and yards to it across the soggy lawn. Not there. I continued looking. Hoofed from one side of the park to the other.My feet were getting wet. Not to be found anywhere. Did it rot? Was it vandalized? Not a soul around to explain. Disappointing. After breakfast the next morning, I drove right to Battery Park. I was on a mission. Gray out. Heavily overcast. I rode the road that parallels the park, slowly, staring out my side window, scanning the whole park. No luck. I turned onto a side street at the end of the park. I man walking his dog was coming out of the park. Quickly I opened my window. “Tell me, sir, what happened to the Indian sculpture?” “Nothing that I know of. It’s still here.” And he pointed to the far end of the park. I looked, but I couldn’t see it. Strange. It was close to where I had first looked last night. How come I missed it? Well, here it was. What a shame if it had been lost. The sculpture looked dark. Nearly black. That is not the way I remembered it. How can you not be curious about such a strange sculpture? It’s a very tall, very slender sculpture. I walked to it. Now it looked better. In fact, it looked good. After all, it wasn’t made of marble or bronze. It was made of wood. Carved from a tree. That’s why I have never thought of it as a statue. To me it’s always been a sculpture. Also to Peter Wolf Toth, who created it, that is what it was. A sculpture. And he was carving it way back then when I ran into him doing it. In fact, I had forgotten his name, although I wrote about him and his sculpture and what he was up to when I got home. I couldn’t remember exactly when that was that I happened to stop by. The plaque at the base of the sculpture said 1984. So that’ s when I saw him making it, in that spring of 1984, again on my way up, or maybe back, from Quebec. I remembered it was a beautiful day. The sculpture was on its side, face up, supported by blocks. A huge log is what it was. And he was working on it with mallet and chisel. Working hard. With great assurance. He had a lot done. I could see it was an Indian man he was bringing forth from that log. This guy was a genuine sculptor. An artist. It was obvious to me. He was working so deft and sure. He was a slim, muscular man, 35, maybe 40. I watched and watched. I asked a little question. And another. He looked up, but only briefly. He answered, and kept answering as he chiseled away, little pieces and big pieces flying off. Didn’t seem to be annoyed. I noticed a strange accent. Amazing that he didn’t have a sketch at hand to guide him. He could visualize this Indian in his mind’s eye. He seemed happy with the nose and the eyes. How delicately he had finished them . It was the sculpture of obviously a chief. I could tell by his native finery and his stately pose. Exaggerated, of course. Had to be because of the limitations of the log’s shape. But noble. Fierce. Impressive. A great chief for sure. This sculptor had a tent set up nearby with camping stuff around it. A woman was busy there. His wife, I speculated. This seemed to be their camp. Living here while the work was going on. This was a big project. Not a one-week or two-week deal. Months of work, it seemed to me. He put down his chisel and mallet. I noted he had other chisels also. And other mallets. Axes, too. He sat on the Indian. Was taking a break. He answered more questions. He participated willingly. Was generous about it. He must have been pestered often by folks like me. But he didn’t give me that impression. He was traveling around the country. Creating an Indian sculpture in every state. He had already done quite a few. A huge undertaking. He was born in Hungary. Came here with his parents as a kid. That explained his accent. His name was Peter Wolf Toth. Strange name for an immigrant. Or so it seemed to me. I never thought to ask him about the Wolf part. Somehow he had become fascinated with Indians. And their culture. Their many cultures, I should say. Had met Indians. Became aware of all the misery they had been through. Admired them. These sculptures were his tribute to them. In each state he studied the local tribes and their history and everything he could about them. His sculpture was never of a specific person. It was his representation of the general traits he saw among them. With details specific to the tribe. And carved it from a local tree. Always a local tree. He got help. Help was essential. I imagined all the preparatory work he had to do. Finding local Indians. Meeting them. Finding the right tree. Finding a site for it. Studying the tree and creating a design to get the most out of it. Getting permissions. Setting up his local operation. On and on. He managed to find help from different benefactors. Maybe a chamber of commerce. Or city fathers. Or some other organization. Maybe individuals. I didn’t imagine he got rich doing this, although I’m sure he got plenty of local publicity. I imagined lots of folks came by to inspect and marvel. This turned out to be his 47th Indian sculpture. I marveled that he had been able to complete so many. Finally I wished him luck and said goodbye and continued on my way. You can tell that it was a great experience for me. It was the first thing I thought of when I stopped in Burlington on this trip. No way could I continue on without pausing to check on the sculpture. I never saw him again. Never heard about him again. Now, I examined the big plaque on the stone base that the sculpture is set up on. All this was done after I left, of course. So all new to me. 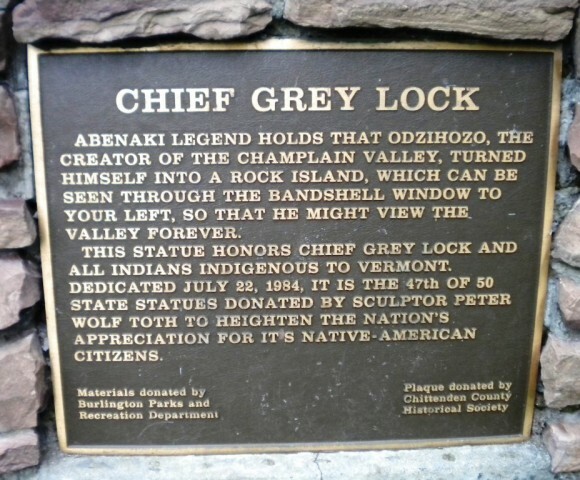 The Indian’s name was Chief Grey Lock. The plaque gave many interesting details. I took a picture of it to show to you, and also of the sculpture. No computers back then. No Internet. Now they exist, of course, and I looked him up online. Found plenty about him. He picked up the name Wolf from a tribe that wanted to honor him for his work. His first sculpture of an Indian was chiseled from sandstone. From then on, always a tree. Maybe wood was a quicker medium. He created more than 74 public sculptures. Major ones (plenty of small ones, too.) Yes, one in every state. All 50. In some states, two, even three. No Indians in Hawaii, of course, so he used a native Hawaiian—one of the indigenous people. That made sense. He went back to Hungary for a visit. Created a sculpture there of some great Hungarian saint. As you see, I was greatly impressed. I was so happy to see his Indian still standing. There in beautiful Battery Park, the most beautiful in town. What a perfect setting. And to hear that local folks love it. Of course I wonder whether there are still native Americans around in Vermont to appreciate how he tried to honor their ancestors. I haven’t been able to determine whether he’s still alive. Still carving. I hope so. 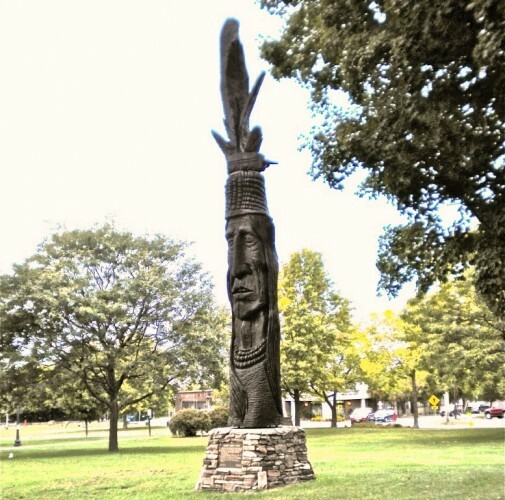 Maybe you’re wondering, where is his Indian sculpture here in our state? It’s in Groton. In storage somewhere there. No explanation why. I wonder whether our casino native Americans know that? Methinks they’d be interested in giving the sculpture its due. But we have two tribes. Two nations. Maybe there’s a problem in that. No idea. Just speculating. If you have a clue, please let me know.….